A civilization is a system of thought, and a system of mood. In other words, a system of mind. Importing massively individuals who have been forged with a deliberately hostile system of mind they cling to, is counterproductive for the host country. However it is exactly what the plutocrats who truly own and govern the host country want: the imposition of a hostile system of mind procures the .1% owners with cheap, compliant labor eager to please, and, moreover, it divides the country, while castigating a spell against all values previously known, anchors of the minds of the little ones vicious plutocrats lord over! Careful reading of the first, and most basic texts of Islam, in particular, show a deliberate intent to destroy Greco-Roman and Zoroastrian civilization, ans, more generally the spirit of the rule of law of these two empires. First time in 1,000 years that raids inside the Fertile Crescent were possible, said Muhammad. Law is local, but plutocracy is global. This means that importation, and, in general, movement of capital itself, is outside of the rule of law. In other words plutocracy is free to grow. Worldwide. Example: a painting was sold for 480 million dollars. We The People don’t know who bought it, and how the capital to buy it, moved. It could be the Mafia for all we know, laundering blood money. Or a pawn of Putin. And art is not taxed, enabling a worldwide tax-free, secret transfer of properties. GDP can’t feed a family. 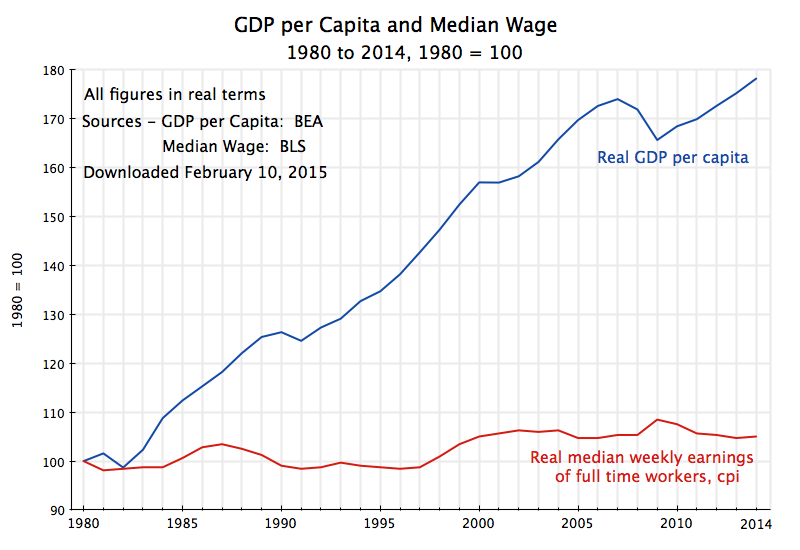 The rise of GDP is the rise of plutocracy. Obama made the elite richer and more arrogant than ever. Standard economic theory says that net inward migration, like free trade, benefits the native population after a lag. But recent research has poked large holes in that argument, while the social and political consequences of open national borders similarly suggest the appropriateness of immigration limits. LONDON – Sociology, anthropology, and history have been making large inroads into the debate on immigration. It seems that Homo economicus, who lives for bread alone, has given way to someone for whom a sense of belonging is at least as important as eating. This makes one doubt that hostility to mass immigration is simply a protest against job losses, depressed wages, and growing inequality. Economics has certainly played a part in the upsurge of identity politics, but the crisis of identity will not be expunged by economic reforms alone. 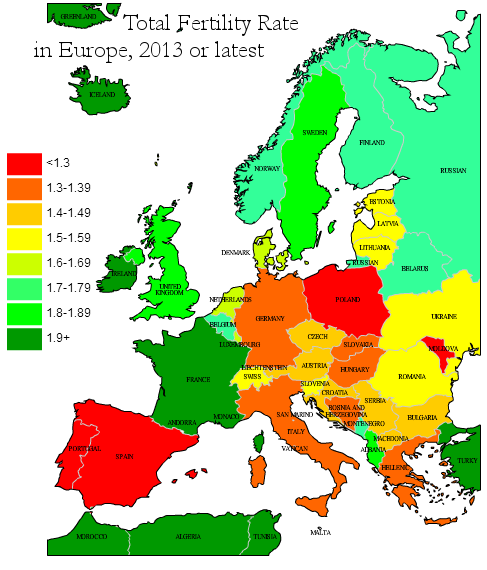 Economic welfare is not the same as social wellbeing. We have been governed by the greedy agents of the unfathomably corrupt. The sexual harassment behaviors of the top guys (including many so-called “democrats”) is just a small new indication of what is going on. In the 1990s, when Bill Clinton’s sexual corruption came to light, people who self-described as “on the left”, or “progressives”, or “liberals with a conscience” scoffed. However, if a guy is corrupt in the semi-private domain, so will it be in governance: the argument is 25 centuries old, and it was made heavily by Confucius and his countless supporters. Indeed, under Clinton, finance became supreme. The reforms of President Roosevelt were rolled back, circumvented, or removed. Mass migration as observed today is often a symptom of the failure of the post-colonialist order. It turns out, it was just a plutocratic order, and billions are left, excluded, exploited and ignored. Even when slavery and colonialism were at their worst, Africans didn’t jump in the sea with their children, to join the European civilization, nearly sure to drown. Think about it. Think about what it means in the world we have. It’s one world, but it’s not for us. Nor for hope. Those who are abused, if they have been abused long enough, cannot conceive of the world differently. They want the abuse, it has become home, sweet home. The Clintons have abused the world, thus all too many people, cannot conceive of the world, any other way. And the more downtrodden and abused, the more enthusiastic about Clintons. And who is this Clinton? Vive La Difference! 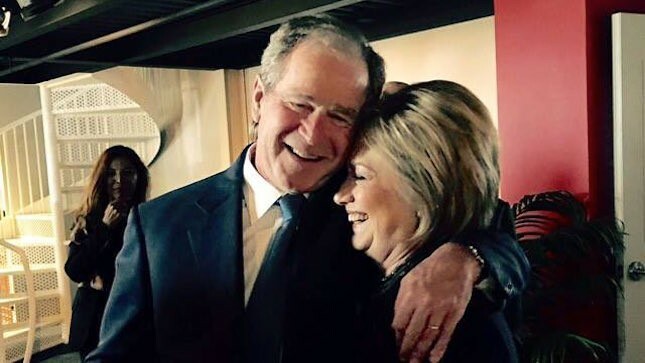 At Least We Killed Together More Than A million Iraqis, & They Love US For It! The Clintons already helped Reagan in his Iran-Contra conspiracy. It’s probably why they were chosen by the powers that be, to nominally lead the world towards oblivion, through plutocracy. Polls recently showed Senator Sanders would defeat Donald Trump by 18%, a gigantic margin. However, for reasons I will not get into here, it’s clear to me that Trump will defeat Clinton. And this is also what the polls tend to indicate. One factor: we have been living in Clintonia, for a quarter of a century. Another word for it: plutocracy, much of it, financial. Trade deals, here and there, to turn around local law, destruction of the Banking Act of 1933. I say this: a good way to get Trump elected is to say outrageous lies about him now. As the lies are outrageous, they are easy to reveal as such. If “democrats” were crafty, they would wait August to tell big lies. But the best way to get president Trump, is to foster Clinton and her cortege of dispiriting ugliness. In other news some savage inspired by Islam (he said), grievously attacked to soldiers in Canada. Meanwhile a joint operation of the French and Belgian police in Brussels resulted in a shootout with Muslims, injuring at least four policemen. One of the wounded police was a French policewoman (France should annex its rogue province of Belgium, especially in light of Belgian tax-cheating for plutocratic corporations, and general lack of imperium). One Jihadist was killed in combat, two, heavily armed Jihadists, succeeded to flee, jumping from roof to roof. The killed Jihadist was a 36 year old Algerian, unlawfully in the European Union, yet unknown from security agencies (as were many of the attackers in Paris in November). And am I against immigration? Foaming at the mouth like a caricature of Trump? Not at all. Am I even against Muslim immigration? Not all. And I think millions of immigrants have been treated abominably by European authorities. Assimilation does not mean one has nothing to bring mentally to the table: it means one brings positive new cultural elements, while one gets help to reject the bad elements one is handicapped with. 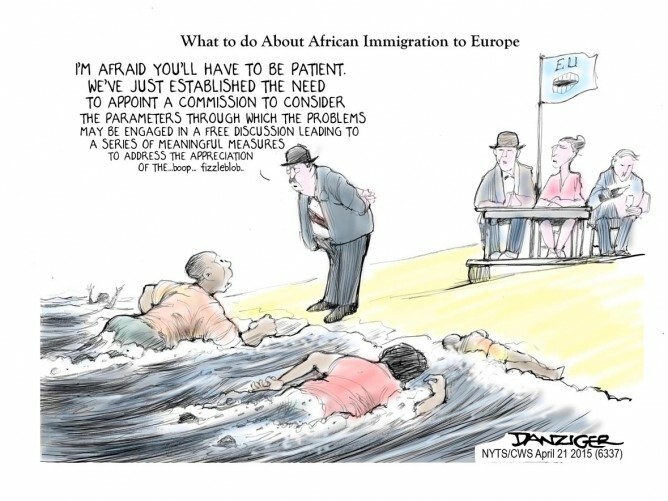 Half Africanizing Europe, or America, is fine with me, as long as it lifts all mental boats. I go even further: at some point Senegalese had French nationality. Thus I believe that, if they look half kosher, Senegalese should be given at least French residency. And thus European residency. The case of Senegal is indeed different from, say, Cameroon; it’s not just a question of history, but mentality. The Senegalese have traded with the West for more than 25 centuries. It’s not their fault if their country has only sun, sand and fish (and now raising seas which force evacuation of villages). Jihadists have been burning with desire to organize a Muslim Wahhabist attack in Senegal, but the strong “Sufi” Senegalese Islam has blocked them. That Senegalese Islam is 100% compatible with 100% Western civilization, thus it is 100% condemnable that it is not supported more by Europe. When my friend Obama ran for the presidency, his main slogan was: “Change You Can Believe In!” Indeed; no change at all. At least, in the case of Clinton, that’s clear: are we going to defeat Donald Trump with Bush’s lover? Change We Can Believe In! More of the same, and not even in a new package! To know the worth of a country, look at how it treats the most innocent, the children. Obama just belatedly proposed to not expulse right away five million immigrants with children (out of at least 11 million illegal immigrants). However genuine the president’s emotions, this all swims in a sea of hypocrisy: why did the “Democrats” not act, when they controlled Congress, and the presidency, five years ago… As they had promised they would? Worse: the measures proposed by Obama are only temporary. If (as is likely) the USA has, within two years, an entire “Republican” government, the ‘generous’ invitation of Obama to illegal immigrants to “come out of the shadows“, will backfire: once localized by authorities, illegals will be thrown out, more easily: a textbook case of bait and switch. Even worse: the gigantic illegal immigration in the USA masks a state system of plutocratic exploitation of (workers and) children. It is deliberate. Deporting children born in the USA, or their parents, would be a violation of the Convention of the Rights of Children, an International Law in all countries, except… the USA. “there are more than a million young people in this country who came — yes, illegally — as children and have lived here ever since. Second, there are large numbers of children who were born here — which makes them U.S. citizens, with all the same rights you and I have — but whose parents came illegally, and are legally subject to being deported. When I say Krugman woke up, I am generous. Like the New York Times, he writes as if he were unaware of the fact that only the USA, on the entire planet, violates the Rights of Children, as official government policy! I sent a powerful comment, the New York Times naturally censored it (this way, if nothing else, they can steal the ideas therein!). It’s reproduced below, and having censored it, is testimony to the general hypocrisy, and that the New York Times is not just far right wing, but somewhat inclined to abuse children, as a matter of systematic thinking. The USA, as a country, loves to give all sorts of lessons to the world. Those high moral principles are often self-dealing, but it requires some work to find how. For example, the actions of the USA to destroy the European imperial (“colonial”) system, starting in 1918, sounded lofty, but aimed at replacing European administration, by American plutocratic exploitation. Similarly, the on-going crack-down on banks, by being more severe with overseas banks, aims to replace world banking by American banking. And the crack-down on tax evasion, by being squarely aimed at the middle class (FATCA), aims to impoverish said middle class, and condition it to live in a police state, while reinforcing the transfer of power from everybody, to the reigning plutocracy (something else Obamacare also achieves). Loving children is natural, being essential to the species’ survival. Hating children, is artificial, perverted. We expect no less from plutocracy, the rule of demonism (demonism, the rule of all things demoniac, in other words, plutocracy, is my answer to Leibnitz’s theodicy). Before I get into the comment censored by the NYT, let me answer those would suggest this is only a problem for the USA. Starting in 1918, the USA maneuvered efficiently to get in control of the world, helped in this by German racial fascism, British naivety, and an idiotic, if not outright treacherous French commander in chief in 1940. The end result is that the USA controls the world. By this I do not mean just that Washington and Wall Street rule. Russia, under Yeltsin was mostly destroyed by the perverse, self-dealing advice given by top American Universities, including the University of Chicago (where Obama taught) and Harvard (where Obama was distinguished, in more ways than one). A lot of this has to do with a vicious mood best cultivated by mistreating children. In 1989, the Convention on the Rights of the Child was adopted by UN General Assembly. On September 2, 1990 it became international law. 194 countries signed and ratified it. With one notable exception: the USA has not ratified it. It is keeping company with Somalia, and South Sudan. Both Somalia and South Sudan are wrecked by war. Is then the USA wrecked by war? War against civilization, maybe? The Rights of Children include not executing children and not making children work. The USA violates both. It is easy to blame the Democrats: after all, they were in control of Congress and Senate (with a super majority) when Obama became president. Too busy partying? Another point is that this immigration which happened illegally obviously happen with the complicity of the state. Or more exactly, the complicity of the United States of America. Indeed, no other advanced country had such an enormous illegal immigration (not only in absolute numbers, but relative numbers). It stretches the imagination beyond decency to pretend that what is, by far, the world’s greatest military power, was such a failure at defending its borders, without deliberately organizing said failure. How is a failure to contain immigration carefully organized? By deliberately organizing weak controls and weak penalties (the same way Great Britain did it). Why is a failure to contain immigration carefully organized? Because of a will-to-exploitation. Interrogating agribusinesses’ owners is revealing: they needed, and need, the illegal workers. They are actually the ones employing the children, in total violation of International Law. Many are far right wing “Republicans”. They support illegal immigration, and have enough money to buy the authorities, including the politicians (who are themselves exploiters, so this is a peer to peer fraternity, exploiters to exploiters, playing kabuki theater). This entire picture is a damning condemnation of the American system. Not just its famed “way of life”, exploiting right and left, but also its way of thinking, and even its emotional system. Americans can go to Church all they want, and evoke god at every turn, but, by the measure that counts the most, their cruel country is the world’s ugliest. Curious, but revealing incident in a park, somewhere in the USA. I was walking with my daughter, when I came across a group of very black children, accompanied by an older white woman. Usually American “blacks” are not that black, and to see a whole group of charcoal like children was exceptional. All the more since they spoke French, not English. Actually, they did not understand English. Having spent most of my childhood in French speaking West (really black) Africa, my interest was raised. My toddler, from her towering 23 months of ancient wisdom, was delighted to meet French speakers, and show them around the playground. Her antics made her instantaneously popular: she was using with proficiency a playground made for children at least 5 year old. Extremely charming: she conducted her business with great seriousness, beaming with pride. I asked the teenagers what they were doing in the USA. I had expected them to be visiting for summer. I was surprised when they demurred. They said I should ask the American lady, who loomed in the distance. I found that weird. I asked the lady. She told me she was an immigration lawyer, and these children were “political refugees”. She had requested the U.S. Immigration to offer them political asylum. At this point the immigration lawyer just walked away. I wondered not why she did. Perhaps to exhibit her generosity, and reconstitute her dominance, like the head chimpanzee exhibits his strength by dragging a branch, she went to help my daughter down a slide. She had not noticed that my sweet angel is a slide master, and could do without someone waiting for her at the bottom. The lady lawyer do-gooder, anxious as she was, to receive the little goddess in her arms, forgot she had a heavy reflex camera hanging around her neck. The representative of justice and love ended smacking generously the heavy black contraption in my toddler’s face. The innocent angel cried profusely, to everybody’s consternation, while her lip swelled. I thought that was a telling moral to the story: to be good, it’s not enough to want to appear good, or even to mean to be good. One has to act well, too. Or one may end mean. So what do I think about all this? Should I go all the way to the bitter end of that lady’s reasoning, and proclaim impoverished Americans to be political refugees in their own country? First, to import Haitian children as if they were political refugees is a travesty of the status of political refugee. Second, that taking children away from Haiti does not help Haiti. An empire of 310 million ought not to steal its substance from a country ten millions. Third that the resources given by the government of the USA to help Haitian children should be sent to Haiti to help them in their own country, where they belong, and where it would help Haiti more, by a multiplier effect. Fourth, I immediately perceived an enormous cultural gap: the Haitian children were delighted to play with my baby, in a way I have never seen American children do it. American children tend to be standoffish , and are conditioned to engage in much less physical interaction, to touch much less, preferably not to approach, to even avoid eye contact, let alone unguarded speech outside of automatic banalities. The Haitian children were all over my blonde child, and delighted by her enthusiastic French babbling. I could not resist thinking that the USA was not their country, they were not made for it, they would have to lose a lot, to stay in the USA, and survive what would be, for all practical purpose, a hostile culture. I actually mentioned this to the lady lawyer, and she retorted that the children will have to stay with the Haitian community. Which brought me back to what was this lawyer was trying to do? OK, maybe she was motivated by greed, sorry, her profession, being paid by some organization(s) to import Haitian children. Or maybe she was truly delusional, and she really thought she was doing good. Indeed, how does it help the USA to put more of a burden on its exhausted social services? How does it help ten million Haitians to have American ladies come, swoop, and steal their children? So now the numbers. In 1940, the USA had 140 million people. In 2011, the white Americans are 196 million, the blacks are about 20 million (I am using rough numbers, from memory). At this point the white population is not growing anymore (maybe because it is not getting enough help from the shrinking social services!) But the total population is 310 million, including 50 million Hispanics (who basically did not exist in 1940, they have been imported since). Why so many Hispanics suddenly? Cheap labor, that’s why. Massive immigration has filled up the coffers of the corporate USA. This strategy of importing quasi slaves has stooped all the way down to infamy: the USA has refused to ratify the Convention on the Rights of the Child (CRC). The USA is the only country to refuse the children rights, with… Somalia, another country involved in ever less government, and ever more military spending. Of course, Somalia is famous for its sea born pirates, while the USA is famous for its financial pirates. So both countries have, indeed, something else in common, besides child labor. The USA closes its collective eyes as Hispanic immigrant children go work the fields, with, or without their parents, who are paid little more, and just as trapped. All this immigration, far from lifting the population which was already there, as it used to, seems to have made its life harder. Why? Well, in the past, the distant past, the government of the USA, thanks to presidents such as Jefferson or Jackson, had seized from Native American Indians, and others, gigantic portions of North America. Then they distributed them for a song to whomever wanted to take possession of them. This instantaneously made citizens of the USA, the richest, and healthiest people, in the world. By far. As more came in, they filled up the extremely needed manpower. Nowadays the situation has completely changed. First, there are robots, and the like. Secondly the government is not in the habit of making free gifts to the middle class, as it did with FDR (when the government employed millions, in a few weeks), or the GI Bill (sending GIs to college for free), or LBJ’s “Great Society”, or even various social programs of Nixon. Thus the main stream population of the USA, the white middle class, was less needed, and actually feared as a potential source of demands, requests, revendications, not to say unions, uncool behavior, or even outright rebellion. So the middle class is being robbed of power, and progressively starved. That starvation is an ongoing process, thanks to Obama, and his bipartisan partner, the Tea Party, who have never seen a tax on the rich they did not want to cut, paid for by cutting public services… to the point the economy of the USA is now grossly misfiring. For example cutting public transportation makes it hard for low income American workers to go to work, or to have any money left once they have transported themselves (and thus are incapable to contribute to economic activity, beyond their own work). But the rich lawyers in their fancy cars (as the lady above in her white Mercedes), or the multimillionaire president aspiring to become a hyper millionaire, don’t care to understand any of this. To import Haitian children is more of the same importation of humans to serve the for profit machine of the last three decades. It does not differ fundamentally from importing slaves in centuries past. Just replace the whip by dissemblance. Some will say: Oh, but the slaves had it hard! Not necessarily so much that they would rebel. Indeed, rebellions of black slaves in the USA were very rare. Remember Jefferson’s children-slaves, who followed him back to the USA, willingly from France? Although they hesitated? Why? Because he made them false promises about freeing them, once they would be back to America. He was a full grown man, with an abyssal bend, they were just children. They believed him, and he lied. Maybe that should be mentioned in his beautiful memorial in Washington? Why not? After talking to these Haitian unfortunates in the only language they knew, my impression was that they were made false promises too. And they seemed to guess it, but it was too painful, and pointless, for them to contemplate. Nobody relishes exploring the potential betrayal of those who profess love, and in whom one has believed. And, of course, they were only children. Three of them could not have been more than 13. When I think back on it, a few days later, my impression is that I witnessed a pretty serious crime. The crime of a would be do-gooder, but still a crime. As the white Mercedes left, Athena pointed towards it a sanctimonious finger, and with a steady gaze, tears drying on her pink cheeks, declared: “Lady nose hurt bad!” Truth comes from the mouth of children.